Andre Nel, the former South Africa fast bowler, has left Surrey by mutual consent. Nel had one year remaining on his contract but both sides have agreed to end the deal prematurely. Nel, 33 claimed 76 wickets in all competitions during two injury-marred seasons with Surrey but is now looking for a new club. 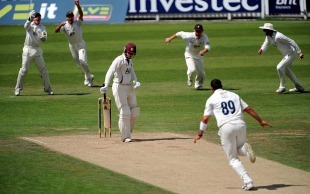 "Whenever Andre was on the pitch for Surrey we never received anything less than 100 percent from him," Chris Adams, the Surrey coach, told the club's website. "Sadly, those times were not as frequent as we all would have liked and the agreement that has been reached is beneficial to us all. He was a huge character both on and off the field and we wish him the very best for the future." Nel, who has Kolpak status and therefore does not count as an overseas player in English domestic cricket, is keen to find a new county to continue his career with. "I enjoyed my time at Surrey and whilst it's a shame to not be returning, I know I still have a lot to give and hope to return and terrorise some more county batsmen soon."